Everyone knows why it’s good to exercise, but sometimes it’s hard to get up the enthusiasm. There are a number of gadgets that might keep the kids (and grown-ups) interested long enough to make exercise a life-long habit – and they are not all expensive and hi-tech. The Wii Fit video game and Balance Board for the Wii console makes exercise completely high-tech. The games include yoga (with a range of poses), strength training (e.g. arm and leg lifts and press-ups), aerobics (such as hula hoping and boxing) and balance training (with skiing, snowboarding and other games). The Balance Board has sensors, making the program interactive, and able to track activity and body mass index, as well as correcting posture during certain exercises. This includes a sensor to go inside a running shoe (or shoes with the sensor built in), and tracks the speed and distance of a walk or run. The sensor transmits information wirelessly to an iPod Nano, iPod Touch or iPhone, and these can be downloaded to the Nike+ website. Dance mats or dance pads are game controllers that connect to computer or video dance games. These games include music, and direct dance moves using flashing lights or arrows. The games will get fast and more complicated, and are surprisingly aerobic (and some say quite addictive). Listening to music can make exercise time seem to go more quickly – and listening to something fast and furious might speed up the running, walking or pedalling on the exercise bike. Don’t have music on too loud, and perhaps only have one earpiece in when running or walking outside, to keep an ear out for other people or traffic. All kids (and lots of grown-ups too) love to bounce. Rebounders or trampettes (small one-person trampolines if space is limited) are a great fun exercise, and surprisingly energetic! They are not too expensive, and can also be bought second-hand or picked up on Freecycle or other recycling sites. Inflatable exercise balls and balance cushions aren’t too expensive, and improve balance and core muscle strength, and are lots of wobbly fun too. Try balancing on a balance cushion on two legs, then with eyes closed, and then just with one leg. Exercise balls also make good desk chairs, strengthening core muscles, so might make homework almost as much fun as exercise. 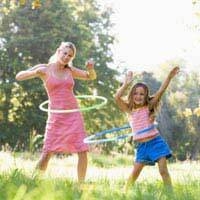 Hula-hoops and skipping ropes are a cheap and cheerful way to get some exercise, and will work outside or in (provided that there’s enough space). Skipping is very aerobic – see how many turns can be done without stopping, or try skipping backwards to add variety. Hula-hooping is good for co-ordination and core muscle strength – once one hoop is easy, see how many ‘hulas’ can be completed without stopping, or even how many hula hoops can be twirled at the same time. Reaction balls are odd shaped and lumpy foam balls, and when thrown at a wall or the floor, will fly off at an unexpected direction, improving speed of reaction and hand-eye co-ordination. Fun Facts: How Fast Can We Go?